The education of our subject was completed in Western College at Western, Iowa. December 24, 1862, he married Mary E. Foote. June 1, 1863, they started for Colorado, and on the 19th of August arrived at Burlington (now Longmont). With him he brought the first threshing machine that was ever hauled across the plains and the first that was ever brought to Boulder County. The long journey overland was made with three wagons and twelve yoke of oxen that formed a part of a train of fifty wagons. One of the members of the party had a quartz mill, one of the first in the state. Indians were numerous, and two weeks after the party arrived at their destination the red men commenced the long series of depredations that cost so many emigrants their lives. Entering a homestead of one hundred and sixty acres near Burlington, Mr. Miller began farming and stock-raising. In 1864 he removed to Rock Creek and bought a large hotel and stage station, where he continued to make his home until 1871. At that time he settled on the present site of Lafayette village, where he pre-empted and purchased six hundred and forty acres of land and began agricultural pursuits. In 1874 he removed to Boulder and there engaged in the meat business until his death, which occurred June 28, 1878. He was a member of Phoenix Hook & Ladder Company and also a member of the town council. A public-spirited man, he always supported enterprises for the benefit of the people and the development of local resources. Generous, whole-souled and hospitable, he was a typical pioneer, whose latch-string always hung on the outside of the door. The only fraternal organization in which he held membership was the Independent Order of Odd Fellows. Mrs. Miller was a daughter of John B. and Sallie (Cole) Foote. Her father, who was a native of Pittsfield, Mass., was born in 1805, and in early manhood removed to Portland, Portland County, N. Y. From there, shortly after his marriage, he removed to Geneseo, the same state, and embarked in the hotel business. One of the early gold seekers in California, after ten months in the mines he returned home with $10,000 in gold. In 1852 he went to Hastings, Mich., where he became proprietor of the largest hotel in the town and also acquired extensive land interests. In 1858 he removed to Iowa, and there, too, he became a large land-owner. His attention was given principally to farming in Iowa. In 1869 he came to Colorado, where he made his home with Mrs. Miller until his death, November 12, 1885. Six children were born to the union of Mr. and Mrs. Miller. They are: Thomas J. and Charles L., who operate the home farm; George I., a prominent farmer whose land adjoins the town of Lafayette; James P., a graduate of the law department of the University of Colorado and at present located at Lafayette; and Frank and Amelia, both deceased. Mrs. Miller has been repeatedly elected to the office of school trustee, and has acted in the capacity of secretary of the board for the past eight years. She is deeply interested in temperance work, and when the town was founded she inserted a clause in every deed prohibiting the sale of all intoxicating drinks in the village. She has frequently been offered large sums to give a deed with the prohibitory clause omitted, but has steadfastly adhered to this principle. In 1884 coal was discovered on the Miller ranch, and on boring a fourteen-foot vein was struck. Three years later the first shaft was sunk, under lease to John Simpson, and in 1888 the second shaft was sunk, the two forming the best producing coal properties in the valley. 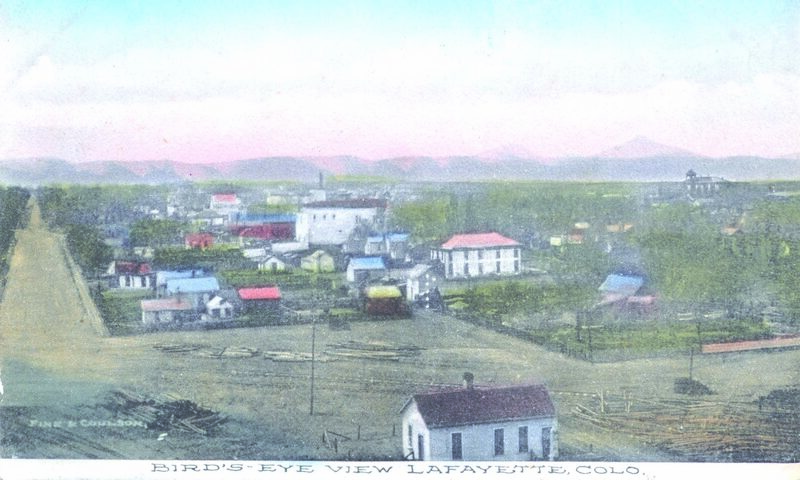 The village of Lafayette is situated on the prairie knoll ten miles east of Boulder, and is reached by the Union Pacific Railroad, which runs two passenger trains each way daily, and by the Burlington road, which has a passenger depot near the village. The climate is exceptionally fine, the water system perfect, the streets well kept and its buildings substantial. Surrounded by a fine farming country, the village will probably become a large agricultural center, as well as a mining town, and every indication points to a prosperous future for it and for its citizens.